Discussions about the “Branch of the Future” tend to focus on slick new lobby concepts and technology like tablets, video chat, and automation. 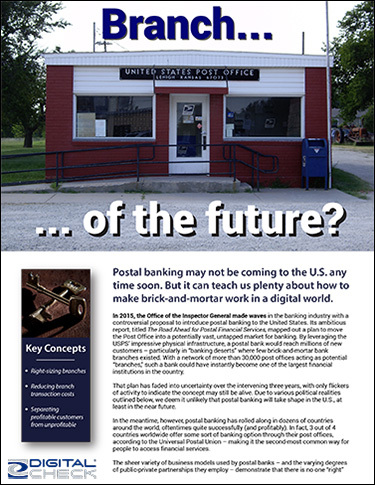 But the real key to keeping brick-and-mortar relevant may come from a surprising place: a 2015 proposal to open banking windows at the United States Post Office. Postal banking probably isn’t coming to the U.S. any time soon – however, its fundamental concepts such as microbranches, right-sizing operations, and agency banking can be applied just as well to the private sector. In an age of declining foot traffic and shrinking margins for in-person banking, these might just be the way for brick-and-mortar to survive. We take a look at how postal banks in several countries make use of these concepts to operate vastly different, but very profitable and convenient branch networks either on their own or in partnership with private-sector banks, and at how these lessons might be applied by any bank today.